UMBC welcomed 50 IBM executives and research leaders to campus on Friday, April 6, for a day-long event designed to broaden the robust research relationship between the two organizations and introduce students to emerging career opportunities at IBM. 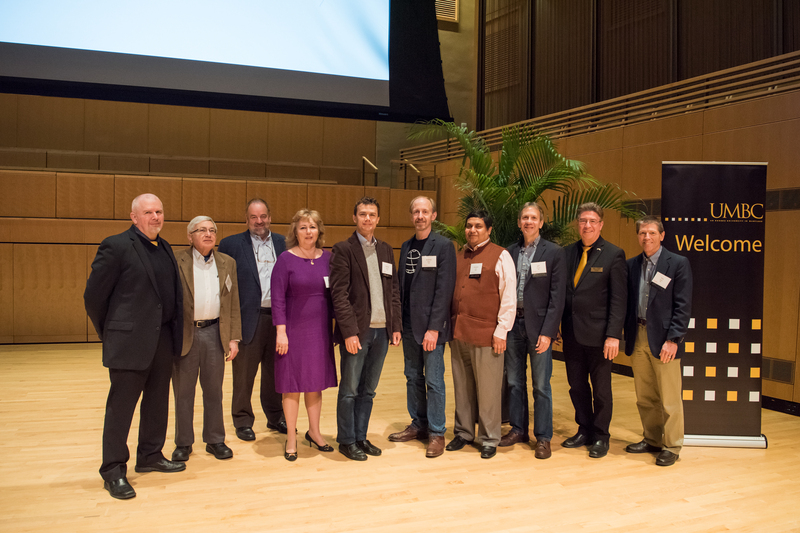 Nearly 250 faculty, staff, students, and partners participated in IBM-UMBC Day. 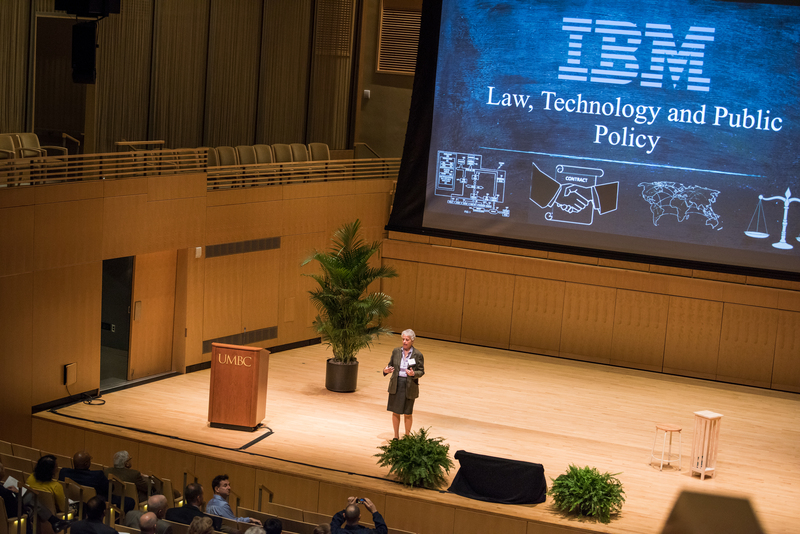 UMBC’s work with IBM began nearly 25 years ago and has branched across a wide range of topics. The university’s most recent research collaboration with IBM connects artificial intelligence with cybersecurity, explained Keith J. Bowman, dean of UMBC’s College of Engineering and Information Technology. Two new areas of likely future collaboration include quantum computing and blockchain. Keith J. Bowman welcoming guests to IBM-UMBC Day. 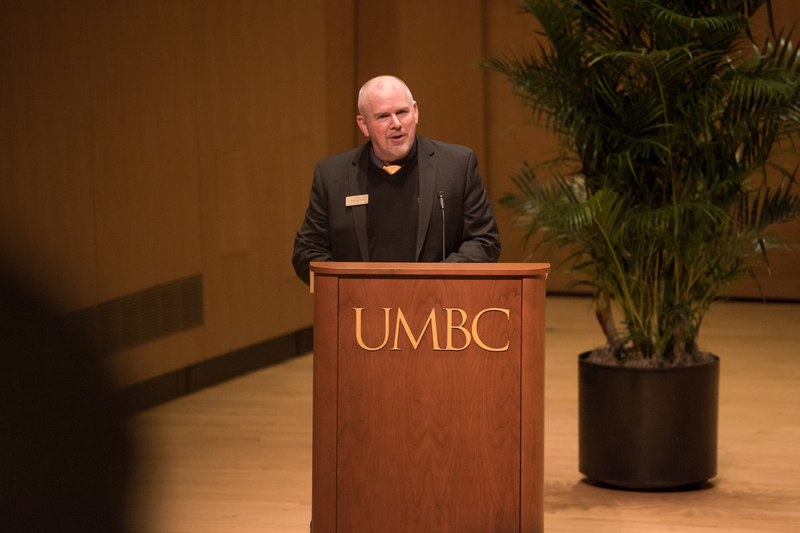 Dave McQueeney, vice president of Corporate Technology and Community and Global University Programs at IBM (and UMBC’s executive champion), gave welcoming remarks for the company. Bowman introduced Anupam Joshi, chair and professor of computer science and electrical engineering (CSEE) at UMBC, who has completed two sabbaticals at IBM. He also welcomed Yelena Yesha, distinguished professor of CSEE, and Andy Rindos, head of IBM’s RTP Center for Advanced Studies, who were instrumental in organizing IBM-UMBC Day. The welcoming speakers set the tone for the event, highlighting a shared commitment to combining diverse perspectives to explore cutting edge research areas in new and exciting ways. Michelle Browdy, IBM’s senior vice president for legal and regulatory affairs, and general counsel, delivered the keynote talk about the intersection of law, technology, and public policy. “It takes a village,” she said, noting that this phrase is especially important in the science and technology space, where collaboration is crucial. Michelle Browdy delivering the keynote talk. Browdy emphasized that her legal team regularly works with business teams and engineers, particularly when technologies are being moved from the lab to the public. She shared how she sees engineers as developing products for people to use and enjoy, and her legal team as an essential complement, managing everything from patents to ensuring compliance with regulations. Following the keynote, technical experts from UMBC and IBM gave brief talks on areas such as quantum computing, cybersecurity, artificial intelligence, cloud computing, the internet of things, and blockchain. UMBC professors Todd Pittman, physics, and Sam Lomonaco, CSEE, joined Andrew Wack, Q platform architect at IBM, in the first technical talk of the day, discussing recent developments in quantum computing and how the field is impacting other industries. A group of UMBC and IBM researchers. Also highlighted in Crume and Joshi’s talk was the Accelerated Cognitive Cybersecurity Lab, which opened in 2016 as a collaboration between UMBC and IBM. The lab is one of many ways in which UMBC and IBM are continuing to grow their partnership, breaking ground in new research areas by combining the creativity and expertise of UMBC faculty and students with the extraordinary technical capabilities of IBM, and together preparing the next generation of computing professionals. After a lunch break featuring technical demos, networking opportunities, and student research presentations, participants regrouped for a discussion about the Watson computer system and cloud computing. Presenters included Mac Devine, vice president of IBM Watson and Cloud Platform; Tim Finin, professor of CSEE, an expert on cloud computing; and Yesha, who has worked with IBM on computing research since the 1990s. Yesha is director of the new Center for Accelerated Real Time Analytics, a $3 million NSF partnership. She described how the center will deploy next-generation computing hardware to solve significant infrastructure challenges, such as protecting massive data sets in the cloud. Students gathered around Pepper during a break between presentations. Nilanjan Banerjee, associate professor of CSEE, next discussed the internet of things and cyber-physical systems, specifically his lab’s work on small sensors. His team’s sensors can be used to monitor whether people operating vehicles are drowsy, and can be used by people with mobility challenges to control devices in their environment. Tim Hahn, distinguished engineer and chief architect of internet of things security at IBM, shared how his team is addressing security issues associated with now-ubiquitous cyber-physical technologies. Roman Vaculin, IBM research, concluded the technical talks with a discussion of how IBM is developing blockchain solutions that can be used across industries. Video recordings from IBM-UMBC Day can be found on the UMBC YouTube channel. 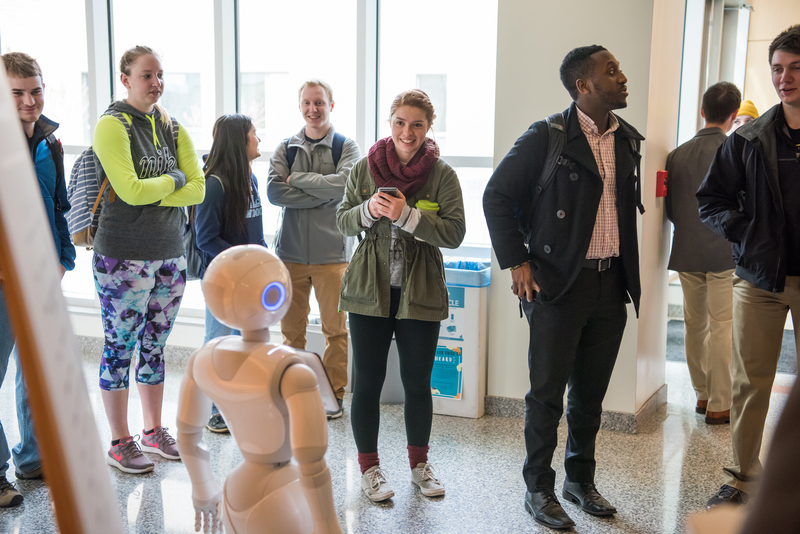 Featured image: A student poses with Pepper, a humanoid robot, at IBM-UMBC Day. All photos by Marlayna Demond ’11 for UMBC.